First of all let me just say thank you to Dan for reacting to customer needs. I would also like to thank Matt Brown for his work on the pixel editor. Viz is now a beast! There is still a limit on how many fixtures you can have but now a string of pixels is a fixture rather than each bulb being a fixture. Very Nice! Old way maxed out on fixtures very quickly. 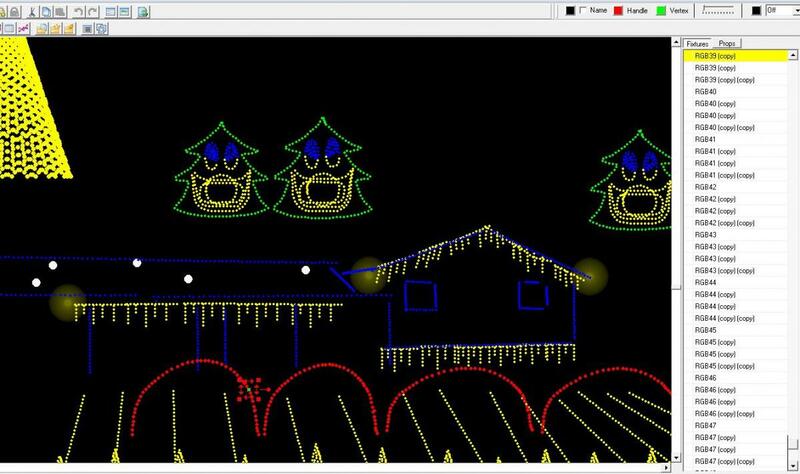 See screenshots below of the old viz using a fixture for each bulb in the arch vs the new viz using 1 fixture for the entire arch. Yes you will have to redraw your viz file however it is extremely fast with the new wizards. Love it! Pixel editor is extremely responsive and updates seamlessly with very minimal PC demand. Intensity files are very small and load quickly as well as save quickly. Really wish the pixel editor could read our old rgb LMS files and pull the actual sequence into the pixel editor. This has been functionality within nutcracker for a long time and has been my main reason for using nutcracker. I like most like to see everything working together in one window so I can edit, apply affects, etc on parts of the display so they will match. I'm loving the new intensity file size but would love it even more if I could take those old huge LMS files and convert them into intensity files. Recreating them from scratch is just simply not an option for myself. It would be great if both the viz and the pixel editor could use the same created props. Recreating them for each part of the software seems a bit counter intuitive. Needing to have the control panel running for the viz to work now will likely trip a lot of folks up. Most users do not sequence on the same PC that runs their show. Easy fix by either installing the usb drivers and or removing the LOR network from the network config. However I also had to command prompt and route the data to my nic so it doesn't overload my wireless network but this I'm assuming could be solved by unchecking control lights as well. Not a huge deal but one that will likely result in a lot of questions from users as S3 did not require the control panel running for viz playback. All in the latest beta has a lot of really awesome features and for those who are new to pixels starting from a clean slate its absolutely awesome. For those with really large pixel sequences already created manually in the sequence editor it would be perfect if we could convert that old data into the new .LPE file format to reduce channel overhead on our old sequences. Again maybe it already does this somehow and I'm just seeing it but I did pull in a sequence completely created in nutcracker and it imported that perfectly and spit out a very small file size at the end. I'm in agreement here that I don't need to see all those RGB channels in the grid our manually edit them. I like the thought process of putting them in an event file that is tiny and is created in the pixel editor. Now I just need a way to get current LMS rgb sequenced channels out of the grid and into the pixel editor and I will be a happy camper. Heres to hoping we will be able to do that in the future. I'm even ok with some type of stand alone converter that requires me to name and align all my current rgb groups with props created in the pixel editor so it knows where I want that old sequence saved to in the pixel editor. Just my 2 cents. Andy, I couldnt agree more. I love the new visualizer. Being able to draw props with the new pixel wizard makes life much easier. I have explored the pixel editor some, added a few props, they made it super easy to work with the preview. I too am trying to figure out where it will fit in my sequencing workflow. I cant imagine not continuing to sequence via the sequence editor, Although I have 25,000 channels I have become pretty adapt at making it work for me. I was hoping after using the sequence editor I could load the lms file into the pixel editor to do some final tweaks. Without being able to load the existing LMS information not sure I can come up with a way to do those tweaks very easily. Like you said a conversion tool for just the RGB props would be wonderful, even if you did have to map them to the pixel editor props. If there was a way to do that sequencing life would be great. I know the release is new and we are all still figuring it out. I love the new stuff, not complaining by no means, just trying to figure out to use the new tools to there full capacity. I like the way the Vis renders shimmers! I'm also very impressed by the Vis. improved shimmer effect. Thanks for the feedback... Especially the suggestions for improvements. We are listening. Well .. Guess I am moving up to the I7 so I don't have to wait 14 minutes for the sequence editor to open. New software takes time to learn and I will get to play this weekend. Something I have not seen yet or heard of. Does the pixel editor have a whole house effect now? I can tell you are frustrated because this is the 3-4th time I have seen you mention the load times. As we keep mentioning the new software will help with that but it takes a shift of channels from the Sequence Editor to the Pixel Editor to accomplish it.. One thing that may help now is a program that Bob is developing that may reduce the size of your sequence especially if it was create using the Super Star software. You can contact Bob by entering a software ticket in our online trouble ticket system. Interacting there can be less confusing. If your pixel stuff was created using xLights then you can move it directly into the Pixel Editor and remove those channels from the Sequence Editor. Another thing is a release that will be out tomorrow or next Wednesday. This is code in the Pixel Editor that will basically move your pixel props from the sequence editor to the Pixel Editor. Thus Sequence Editor will no longer need to deal with them and the sequence file will become significantly smaller. As far as a whole house effect. You can create a group of props and apply an effect across all of them. Jeff, I have an I7 with 6 Gb memory. My biggest sequence is 192.5 Megs, nowhere near the size of yours, but it still took 1:23.76 to load and the Audio file did not load. Quite a bit better, but still not as good as hoped. My display by the Pixel Editor <Info> window says 12,474 total channels of which 72 channels are non-RGB. However, those props are, I assume the Non pixel RGB type. The total comes out exactly to the channels my stars and mini trees. This total does not include the any effects in the matrix which is 288 pixels. On another note, if you decide to sell the I5 and buy an I7, give me a price. I'm in the market for a new desktop. That is of course, if the I5 you have is a desktop. If we can agree on a price, just bring it next time you come to TN and we'll deal. Right now I have been able to open my old sequences from last year that would not play because they where 1.1 gigs in size they are opening at a much faster rate less than 3 min and while playing the sequence during the real heavy effects there is no lag like I had with S3. I am running an intel i5 with 16 gigs of ram with windows 7. When sequencing with 4.0.2 I have found that the play pause is still lagging a bit when you hit the space bar but not as bad as S3 was, at times in S3 I would have to wait 10 to 15 seconds for it to start playing. I really like the design of the new pixel editor but get frustrated while sequencing in there, when trying to start and stop for fine tuning the placement of the effects I would really like to see the play\stop feature with using the space bar. one thing that does worry me is there are certain spots in a sequence where I hand sequence an element in the sequence editor because it is the only way to get the effect I want on that element. I have not been able to see it in the pixel editor when I open an existing sequence. so I guess I am wondering how that will come into play when using both the sequence editor and the pixel editor on a song. Thanks for replying Dan. Each year the show got bigger and bigger and I spent a full 15 minutes the other day in hope that LOR 4.0 would open the sequence editor faster. I have not had time to play with the new tools that 4.0 offers yet due to work. I will have plenty of time this weekend.. Yea.. All my sequences are built the hard way I guess you can say along with many times of crashing till the patch came along. I have superstar and only used it twice since I had it LOL. I do know I am around 32,000 channels and 300 ac channels and I sure hate leaving the ole sequence editor that we all grew to love. Well reading this again I see that new revision are coming that will help me move prop straight the new pixel editor. That will be a time saver for sure and the whole house effect will be great to. I will play this weekend as I prepare to move if all goes well. I am very disappointed in S4. One, my visualizer does not work. My files that worked in 3.12 don't work at all. And when I try to go to legacy visualizer it just stops working. So visualizer is a total fail for me. Two, I am a superstar user. Love superstar. But I would like to use the pixel editor from time to time. With s4 you can use either but not both. So, if I want to combine them this seems unavailable. Three, pixel editor has very limited effects. This would be fine if I could combine with superstar, but having to choose just limits me too much. With visualizer not working, I am unable to test further. But for me this is a total fail. I had high hopes, but it just doesn't look too promising. Totally agree. S4 is a stripped down, old version of xlights, except not free. I do like the work Brian did in SS and DMX. But overall, agree with sax, not good. Why doesnt the visualizer work? Works great for me, best part of the upgrade so far. What are you having trouble with on the visualizer? Dan has indicated soon we will be able to load both regular sequence editor files and super star files into the pixel editor. Give them some time, after all this is a beta test, who knows what will be in the final version come June. I see where you have opened 2 issues with the visualizer. I fixed one today and will be looking at the other in the morning. Sorry it has taken me longer than 2 days to get to it, but I have a lot of other responsibilities as well as Visualizer fixes. Is there something ELSE that is wrong with the Vis that you have not reported? Unable to continue testing at all. When I deselect advanced rendering, press play or simulate then nothing works at all. Nothing in visualizer that is. Yes, control lights is selected as well as control visualizer and I have the control panel running. I have 2 visualizer files I have tried...one for Halloween and one for Christmas...neither works. I realize you have more issues than mine. And it appears that others are having huge success. I am also not able to give my full attention to trying to correct the faults by attempting to do some rebuilding of the visualizer etc. due to life...spelled W. O. R. K. So, I might be able to find something simple to be the cause once I can tinker more. Thanks for the hard work. I hope you find an easy solution to my issue. I will tinker more when I can. I have to disagree that S4 is a total fail. Yes it is a snapshot of nutcracker but we knew that months ago. It is also the beginning of a transformation on the way we do sequencing in LOR. Yes the grid is great for standard channels but nutcracker proved with their success that it is not the ideal way to sequence pixels. Sax I hope you and Dev Mike are able to work out whats going on with your visualizer because once you get it up and running I can almost promise you are going to love it. Shot in the dark but have you tried plugging up your LOR usb 485 dongle to the pc you are running the viz on or go into the network settings and removed the LOR network from there and then reopen the sequence, check on control viz, then open the viz hit play and see what happens? I had to tinker with it for a few to get it to play but once I did that it worked perfectly. Dev Mike I will have a go at turning the rendering engine on and off this weekend once I get the entire show drawn out and let you know what I find. Jeff I cant remember if you put an SSD in that rig when you built it last year or not but an SSD will speed things up tremendously. Intel also just dropped a new SSD that is a true game changer in data transfer speeds with sequential write speeds of 2,200 MB/s and read speeds of 900 MB/s! Yes that is 2.2 GB a second write speeds on a single drive, not raid 0 like I'm running to get those speeds. But you will need an M.2 slot or a PCI 3.0 slot to run it. Sorry I got off topic but yes if you didn't put an SSD in you need to do that first. We will also get together on how you can lower that grid channel count. Your roof matrix can come out of the channel config entirely and go into the pixel editor as your never going to manually sequence that thing. Hopefully soon you will be able to take that pixel tree that was created in superstar and export it into the pixel editor or combine it with your pixel editor created intensity file and remove those channels from the grid as well. If we add in your house posts to the pixel editor and all 5 or 6 of those other GEC trees as well your actual grid based channels are going to shrink to an LMS file that opens in seconds rather than mins. Oh and yes you can do whole house in the pixel editor by creating your props and then grouping them into one large prop that you can run affects on or you can use superstar and do morphs across the whole house. I personally love the way this is headed but like Doug said we got to keep in mind this is a beta after all. If it gets to the point where all 3 programs SS, SE, and the Pixel editor work together and I can create one sequence using all 3 programs I'm sold and I can promise I wasn't sold until I spent some time playing with the new features. My end game here would be to take all of my pixels out of the grid in SE and only sequence my AC channels in the grid. This brings up another interesting topic though of sharing sequences. One of the big upsides to LOR has always been being able to share your sequences with other users. In SS this will still be simple as you could just export them out of SS but maybe something to think about for pixel editor sequences. Regardless, keep bringing on the beta updates guys! Here's another comparison for you. I have an I7-4710MQ with 16 gigs ram and a 4 gig GeForce 860M. My largest sequence is 428 megs and loads in 25 seconds with the S4 Sequence Editor. I am a newbie to the pixel world with one year under my belt. I did just a few of my sequences with "pixel effects" from NC and the rest I grouped to be just a gloried mega tree sequence. In the process of flushing out some bad sectors on my sequencing computer so I can backup and change out the hard drive. So I haven't downloaded s4 yet. As other post of mine said, real excited to get to work / play with the new version. I am running an Intel i5 with 16 gigs of ram and my largest sequence from last year is 1.01 gigs and would take well over 5 min to open in S3, in S4 it is taking right around 2 min to open. I could not use this sequence last year even using the compressed sequence for the show it would freeze up and sometimes would not even load for play during a show. I am seeing a great improvement with this issue in 4.0.2 there is still a lag while sequencing with the play\pause using the space bar but not as bad as S3 was, it does spend a lot of time in not responding mode. I really like the addition of the Pixel editor but do have my concerns with it. I do find it frustrating while sequencing and trying to play\stop for fine tuning where I would like the effect to start and stop. At this time I can not see any of the effects that have been added to the pixels in the sequence editor. Some effects I do by hand to get the look I am after and can not be made in the pixel editor. I am concerned as to how this will work with the addition of the pixel editor. I was able to correct my visualizer problems on my own. It turns out that the DMX dongle must be plugged in. I don't have a spare dongle so I had to actually go and get it off my show computer. The humanity!! Also, I had upgraded a few of my elements from last year...or I am in the process of upgrading...and I had not added the new universes to my networks tab. I did it and it now works fine. This visualizer is looking the same as my old visualizer though. Yeah, shimmer might look a little more accurate but honestly, in an RGB environment I seldom use shimmer. So maybe this allows me to do more shimmer???? But, visualizer now and 3.12.......very similar to me. I suspect I will notice the difference as I add more elements that cause the visualizer to bog down or lag....but I just haven't seen that in the past. Now I am trying to learn how the intensity files work. I just cant seem to export from Superstar with an intensity file. It says it does but the data just doesnt play. But that is a different problem..different thread.